A charming English thatched cottage set in a pretty North Dorset village, an idyllic countryside retreat. A short stroll from the award winning 'Museum Inn' - a quintessential English pub! 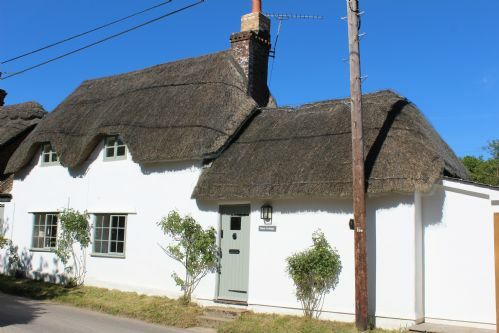 Eton Cottage has recently been refurbished to the highest standard and enjoys a great mix of 'picture postcard' thatched cottage with a modern and stylish interior. With stunning local walks from the door over the beautiful rolling chalk downland of the ancient Cranborne Chase, and an Area of Outstanding Natural Beauty. The cottage offers 2 double bedrooms, one of which is located on the ground floor and a cosy sitting/dining room with stylish log burning stove. A small private garden offers the perfect place to enjoy a drink, eat at or relax in whilst soaking up this rural retreat! The cottage is within an easy level walk to an award winning pub, 'The Museum Inn'. Farnham is a small rural village in north Dorset and is a great starting point to explore some of the wonderful countryside with miles of footpaths to roam right on the doorstep. A little further afield is the pretty town of Shaftsbury and the iconic 'Gold Hill' and just half an hour from West Moors Country Park; with a high ropes course, miniature railway and bike hire - making this a great day out for all ages! Stayed in several of Mulberrys Cottages and all have been excellent. Will definitely recommend and use again. Thank you for your wonderful review, we are really pleased that you enjoyed your stay at Eton Cottage and look forward to seeing you again in the future! WE LIKE TO COOK AND THE KITCHEN WAS NOT THAT WELL THOUGHT OUT - BUT EVERYTHING WAS THERE. Thank you for taking the time to leave a review. We are pleased everything went well and we hope to see you again in the future. Well appointed, ultra clean cottage in a pretty, quiet village. The owners were helpful, lovely and generous with their welcome. Lovely views from the top bedroom across fields. Really good Pub nearby serving gorgeous food. Owners have a brilliant array of coffee makers and left delicious organic bread in their welcome hamper! My other half had a brilliant stay while recuperating from a cycling accident. Really comfortable beds and relaxing garden. We would definitely want to go back to the cottage as a family and explore the area. Thank you ever so much for your lovely and informative feedback, we are delighted that you enjoyed your stay. We hope to see you again in the near future! "The owners have made a wonderful job of transforming the cottage and it has a most welcome feeling. It is always a lovely surprise to find a hamper of goodies waiting for you upon arrival, especially with well thought out items which have been locally sourced. Nicky has thought of everything, top quality bedlinen, The White Company bath and shower products and a very comfortable bed. There are some fantastic pubs in the area and The Museum Inn serves a great selection of wines and beers as well as top notch food. I am really looking to going back when the weather is warmer and explore a few more of the wonderful walks and enjoy a relaxing drink in the evening sun sitting on the patio. I can’t recommend the hosts and cottage highly enough, Thank you." Take a relaxing stroll around the Larmer Tree Gardens, home of the Larmer Tree Music Festival, visit the Cathedral in Salisbury or visit the Royal Signals Museum at Blandford. Bedroom 2 (sleeps 2), double bed with character fireplace, bathroom with WC and bath. Dressing area. Small enclosed garden with BBQ, table and chairs. Dog wash station.